Maybe you’re ready for more in your life at work. That might mean more opportunity, money, meaning, or growth. Feels like a million paths to get there, right? 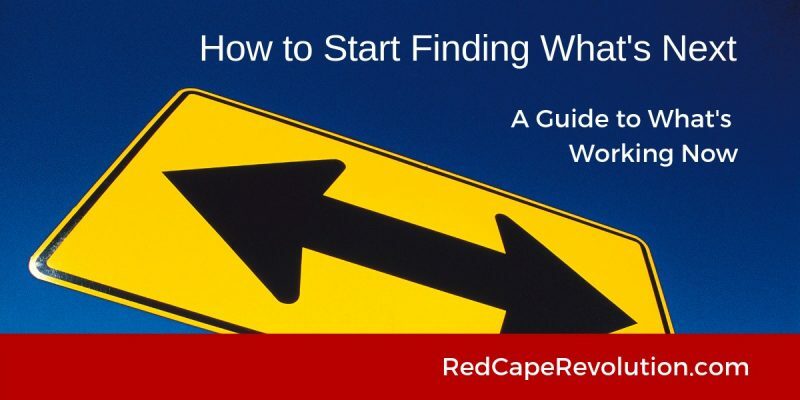 But how do you START finding what’s next at work? Where should you look? What’s the first step? Honestly, there’s an awful lot of craptastic advice out there. And yet, it keeps getting repeated, over and over again. It’s so confusing that too many people give up. It feels a lot easier to stay stuck. It’ll show you how to start finding what’s next at work, in a way that works for today’s talented professionals just like you. Update your resume or hire someone to do it. Just be grateful you have a job. Do not be suckered into wasting time and energy on ANY of these traps right now. The truth is that each of these traps are things that help us hide. They lie to us and make us feel like we’re making progress. But they don’t. Each one just helps us stay stuck. You’re too awesome to let that happen to you. Avoid the traps. Read more here specifically about why updating your resume is the wrong place to start. Okay, you’ve heard the warnings. Now let’s dive into what’s working right now for smart professionals like you. These are the same three steps I recommend to any of my coaching clients who are asking “what’s next for me?” They’re the actions that I promise will get you moving forward, fast. Step 1: Schedule alone time in the next few days to ask yourself three big questions. What am I doing when I’m in my superpower space? What are the environments where I thrive? What will happen if I don’t make a change? Your answers to these questions help you begin to get clear on who you are and what you want now. I don’t mean what you want in terms of a specific role. I mean what you want from your life at work. You just need to let yourself listen to them, and not talk yourself out of wanting what you want. The truth only comes out when you’re on your own and getting honest about your thoughts. It’s not always fun, but it works. Step 2: Make individual dates to meet with 3-5 people you already know. I’ll make you a promise: your next opportunity will not fall magically from the living room ceiling while you’re watching Game of Thrones. It will come from people. Start the process of reaching out to people who you already know, but who you haven’t talked to in a while. Follow your curiosity–who intrigues you? Who’s doing work that looks interesting, at least from where you sit? Pick people who are in professions, companies or industries you’re curious about, and invite them to a meal, cup of coffee, or even just a phone call. WARNING! YOU ARE NOT ASKING ANYONE FOR A JOB, A JOB REFERRAL, OR AN INFORMATIONAL INTERVIEW. You’re simply inviting another human being to a chat with you, another human being. Your conversation is focused on them, not you. It gives you a chance to gather new data and ideas as you get clearer on what you want to pursue next. And it makes someone else feel good to have an opportunity to share their experiences without any pressure to do anything for someone else. Most people are happy to share their experiences and perspectives as long as they feel you’re geniuinely interested in them–not in what you think they can do for you. But you’ve got to be the one to ask. You’re building (or rebuilding) relationships here–relationships that will lead you to new insights, ideas, and ultimately, opportunties. Read more on how to cultivate relationships here. It’s easy to assume there are no opportunities to get what you want right where you are. We think that if what we wanted was here, we’d have it, right? It’s a dangerous–and wasteful–mindset to have. Organizations are messy. No matter what straight lines appear to exist, work happens in squiggly lines. For you, that means you don’t have to wait until the perfect, fully baked job pops up on the “open opportunities” database. You don’t have to wait for the promotion fairy to come down and sprinkle bonus dust on your head, either. If you want new opportunities, you need to tell your boss and other leaders that you want new opportunities. More importantly, you need to paint a picture for them of what it looks like, and how it’ll help the company overall. Truth is, you’ve grown since you arrived where you are. But it didn’t happen overnight–it happened inch by inch. So it’s common that those who’ve known us for a while won’t always see our growth–or our dissatisfaction. Even the best, most insightful and empathetic managers can’t read your mind to know that you’re ready for a new challenge, or that you’re feeling restless, bored, or undervalued. You’ve got to get honest with them. Start talking. Steal these scripts to start having tough conversations when it’s time for change. Once You’ve Started, What Do You Do Next? Getting started is the hardest part. Congratulations! Don’t discount your actions –many never get this far. You’re now making forward progress. This is where an experienced coach can accelerate your progress, hold you accountable and give you a safe, confidential sounding board. It’s not easy to do this alone. Learn more about what a coaching partnership is like by scheduling your consultation here (free). As you keep moving forward, there’ll be the right time and place to dive into leveraging tools like a resume, job postings, LinkedIn, and relationships with recruiters. But for now, set those aside, focus on these three actions, and start finding what’s next for you right now. Like this guide? Join our Insider Community now and get more stories, strategies, motivation & inspiration I share exclusively in email.